20-Mar-2009 63084 is always an exceedingly colorful train, courtesy of the UBC and IFF bulktainers it carries to the giant DSM chemical complex in Geleen-Lutterade. It has almost reached its destination in this view, showing 6517 powering it southbound out of the Sittard station. The red paint on almost all 6400-class road switchers is fading to all kinds of pink hues. They already now look far worse than they ever did in their original grey and yellow paint scheme. 6517 with 63084 (Warffum - Lutterade DSM) southbound in Sittard. 28-Feb-2009 It's been a good while since I ventured out to take pictures around here. The weather has been absolutely abysmal, and the short daylight hours didn't do anything to enhance the situation. The 2800-class electrics have a firm grip on traffic, but class 55s are still booked for a few trains and occasionally show up on others. The private guys continue using their 66s, so at least there are some decent diesels to be seen. Such as the Ewals train in this view, being brought through the maze of shiny new poles in Buschhausen, just 3 kilometers outside Montzen. Spring is finally upon us, the snowdrops and crocus are starting to bloom. Before too long the trees shall turn green and drab views of forests such as this one will be a thing of the past... DLC PB18 leads the DGS 40168 (Novara/I - Genk-Zeehaven) in Buschhausen. 26-Jan-2009 So, looks like this week we're wrapping it up for the venerable 55s. 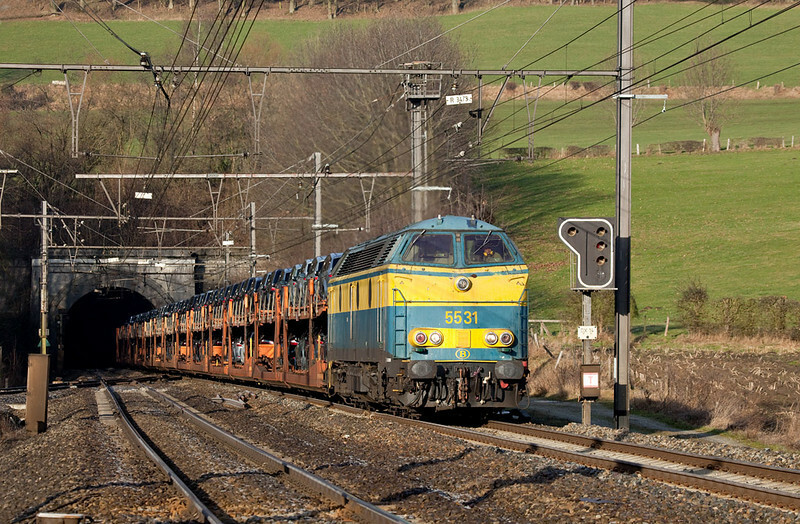 What probably has become the best-known Belgian diesel series faces an uncertain future as their total replacement in freight service (at least on the L24) will come very soon indeed. Get your pictures now! This morning 5531 put on a fine show at the Gulp Tunnel with another victim of the recession, the Ford auto train from Genk. Rumor has it this will be history next week, as B-Cargo find themselves with a lot of engines and not a lot of traffic. Farewell, chant of the 16-567! 5531 with the Ford train 46511 (Genk-Zuid-Ford - Carimate) exiting the Gulptunnel in Hindel. 16-Jan-2009 Had a bit of time to kill yesterday evening and decided to head on down to Aachen West which I hadn't done in a good while. The yard is nicely lit up and the head of the stored engines line was conveniently parked underneath a lamp, making this shot possible. 2820 will be the next engine out after a train arrives from Germany to be taken into Belgium. The engineer does his checks and has turned on the cab lights. Temps still hovering around freezing but daytime sun has killed most of the snow. 2820 at Aachen West. 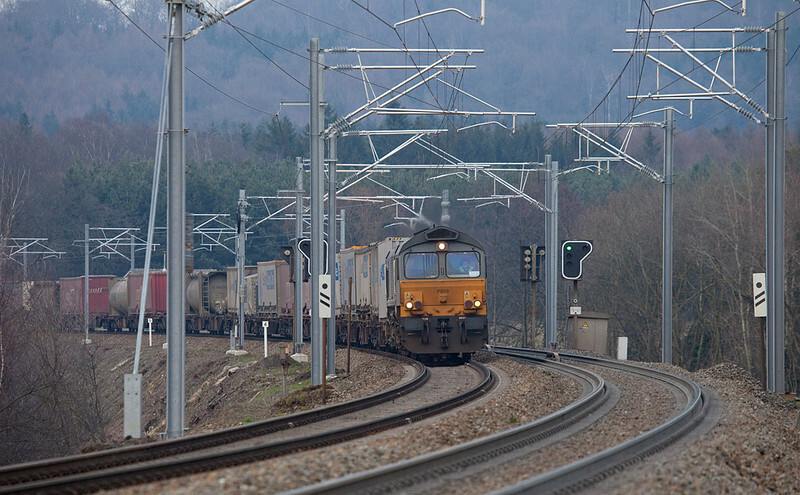 9-Jan-2009 While hanging out on the L40 in the valley of the river Meuse, waiting for a couple freights, this class 13 electric showed up in sweet light. Looks like that pantograph has already scraped a significant amount of gunk and copper off the overhead in its lifetime. The 13s are weird animals, at least optically. Considering they are close relatives to the French Astride, it seems whoever designed the nose and cab section must have been in a real hurry... You'll notice there's still snow on the ground. Temps never topped -5 degrees C the entire day. Did I previously moan about how we never got any real winters around here...? 1342 with IC Maastricht - Oostende in Hermalle-sous-Argenteau. 6-Jan-2009 Good way to start the new year! The cold spell already lasts much longer than expected and in fact we reached -20 degrees C on the 6th of January, with a nice snow on the ground. Reason enough to quit the office early and enjoy the sun. After a cold afternoon in Stolberg (east of Aachen) the very last shot of the day netted 2809 racing westbound with the FE 44532 (Gremberg - Antwerpen Noord) into the setting sun. In better times, this train would have had a trio of class 77 diesels on the point. If there's something to be said for light, fast freights it's the nice snowstorm they produce even in snow that's been on the ground for a couple days. Happy and healthy New Year everybody! 2809 with the FE 44532 (Gremberg - Antwerpen Noord) in Stolberg/D. 30-Dec-2008 Traffic slowly picks up again so a short excursion to the high iron was in order. I last visited this spot at the tunnel near Gemmenich (border between Germany and Belgium) about a year ago. The masts and catenary have destroyed all the nice sight lines that were there previously, and the Traxxes are not doing anything to compensate for the loss - quite the contrary. Well, we can moan all we want, that's what we get from now on until someone figures out that, in fact, electricity doesn't just appear out of thin air. I don't think the current witch hunt against CO2 and accompanying irrational belief in electricity as the all-encompassing solution is going to end anytime soon. Ah well... At least Infrabel took the chainsaw to the brush in a massive way, opening up a number of angles again. 2821 brings the DGS 41548 (Ludwigshafen - Antwerpen BASF) westbound through Botzelaar. 29-Dec-2008 The period between Christmas and New Years is always a trying time for the railfan seeking freight train action. This year is even worse because of the weekdays occupied by the holidays. We're in the middle of a week-long cold spell here and that invariably means clear skies and sun (we never get cold temps and precipitation at the same time). Alas, no freights run. So rather than not do anything, one takes aim at window trains. 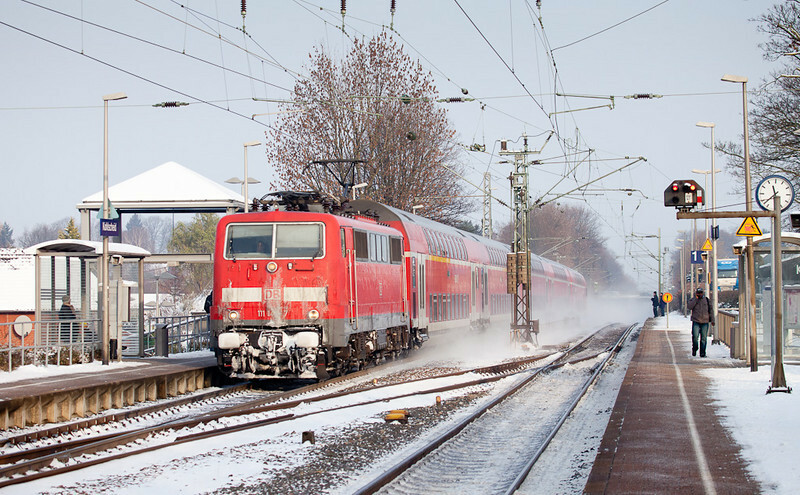 Here's one of the few Dutch-owned ICE3M (for multi-system) trainsets departing Aachen for Frankfurt. You can just see the "Hispeed" logo where usually the "DB" logo would be placed on the nose. 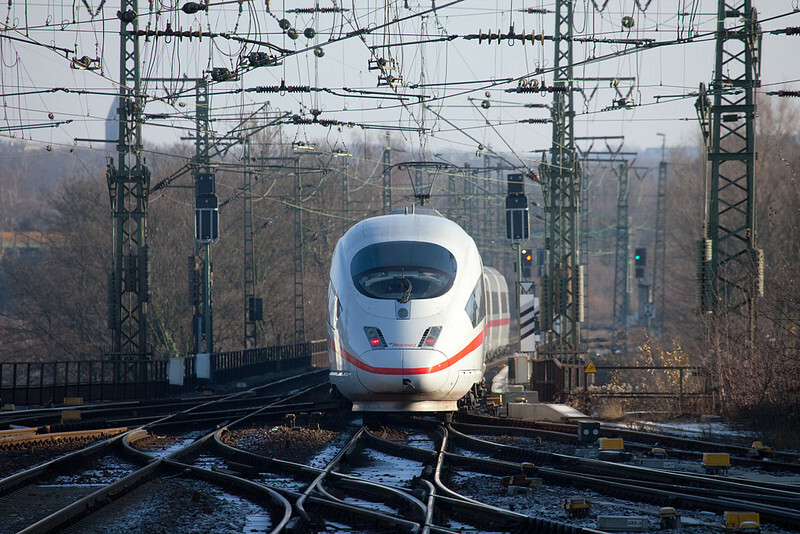 NS Hispeed ICE3M on the Burtscheider Viadukt east of Aachen Hbf. 20-Dec-2008 With most other activity at Montzen having dried up as a result of the recent startup of electric Cobra operations (Cobra = Corridor Operations B-Cargo - Railion), the private guys are the only show in town. DLC has been using Montzen as the base of operations for some time. 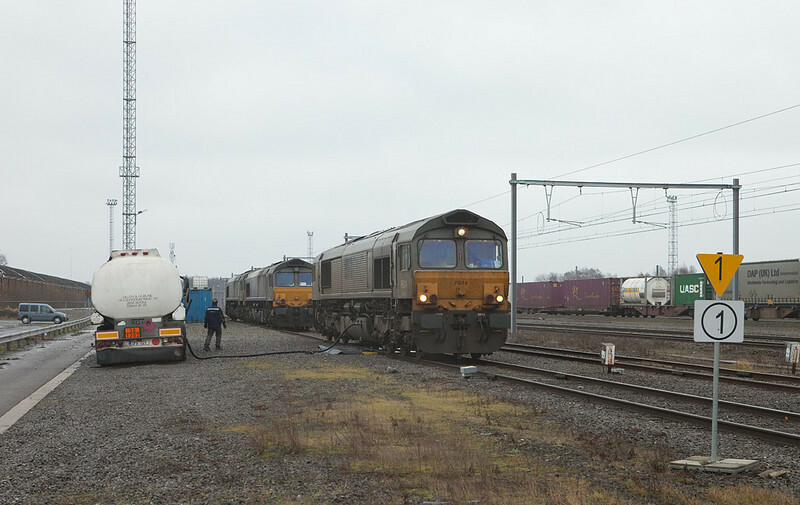 On this particular day, 5 class 66 engines were in the yard - one Rurtalbahn/Trainsport unit and four DLC engines. Here PB14 has cut away from her intermodal train in the background and rolled up to the "portable gas station" for a drink. PB18 and PB13 are in the background, PB15 behind the photographer. 20-Dec-2008 A passenger train was scheduled across the L24 today. This is usually a freight-only line, so a special window train is always interesting. Here 2828 powers the train out of the Tunnel de Fourons, enroute to the Christmas market in Aachen. The train consisted of 9 cars, including two kitchen-buffet cars, plus 2802 trailing. The light was downright abysmal, especially in the cut here. Even with really high ISO settings exposure times were a stretch. Welcome to the shortest day of the year, it can only get better from here. Happy winter solstice/Meán Geimhridh/Alban Arthan/Sanghamitta (or whatever you're celebrating) everybody! 2828 with 18524 Forest Voitures 09:10 - Aachen Hbf 12:26. 13-Dec-2008 A full moon on a clear, cold night made me go out and experiment a little. As luck would have it the last 225-hauled train into Belgium showed up at the right time. 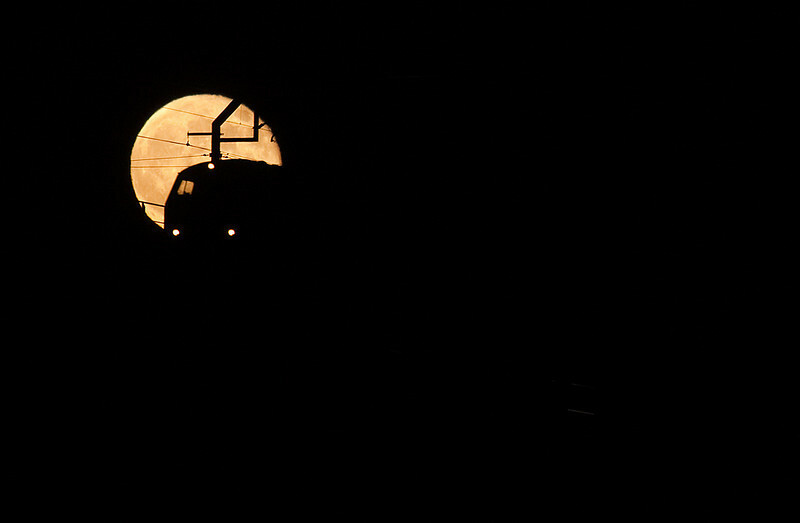 Here it is silhouetted against the largest full moon of the year. 13-Dec-2008 Later the same day another festivity celebrated a meet of two trains powered by class 28s. The grain extra on the right salutes the incoming DGS 40242 (Oleggio - Oorderen). The intermodal ran across a number of torpedoes on the track and through a sea of red fusees. 13-Dec-2008 So - it's official. On saturday a small impromptu festivity was held in Montzen yard to commemorate the end of most operations there. A number of the engineers, switchmen, and tower personnel were on hand to pose in front of some of the engines that (used to) run there. 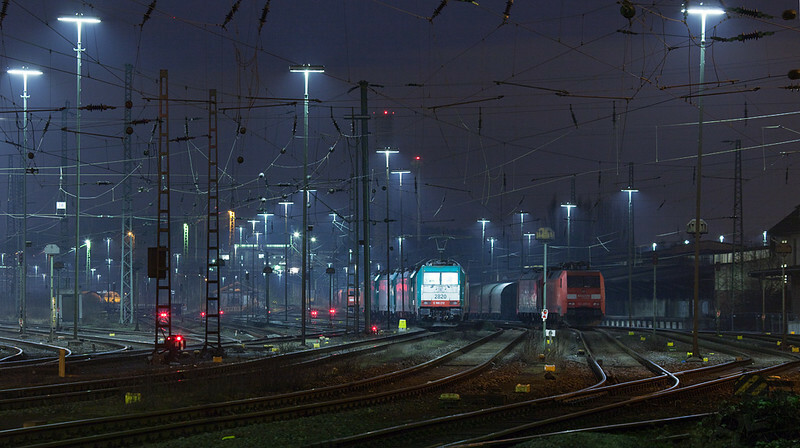 Left to right a new class 28 Traxx, 40 of which are taking over most of the trains into Germany. 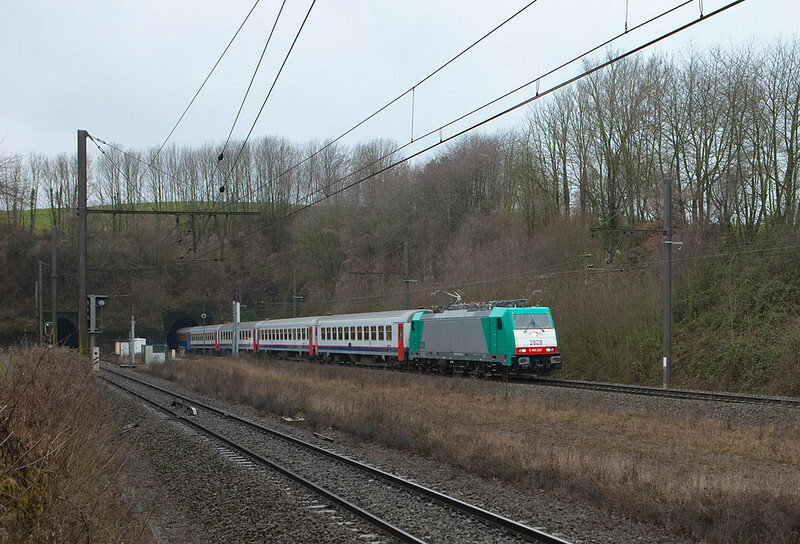 Then a class 20 and class 23 3kV DC electrics which are the losers because of their BeNeLux-only equipment. Then a "passenger" and freight class 55 (the blue paint scheme denotes head-end power equipment instead of the original heating boiler). 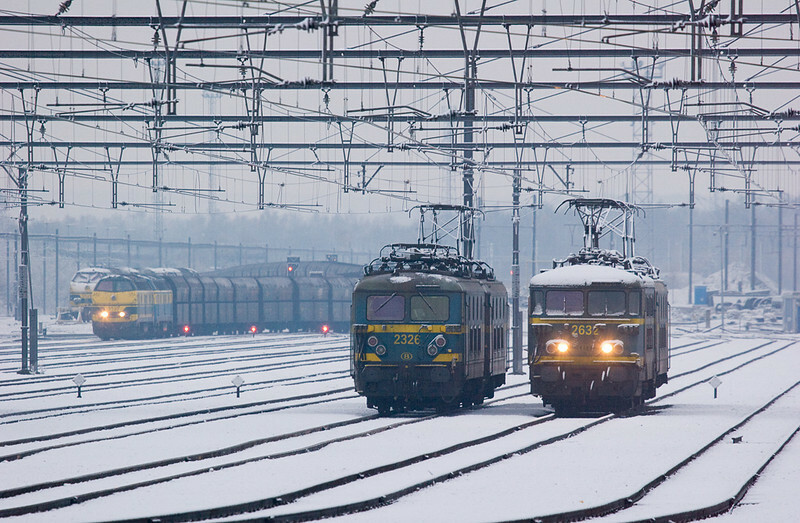 And on the far right an ex-GDR class 241.8 "super Ludmilla", reengined with a 4000 hp russian Kolomna diesel. 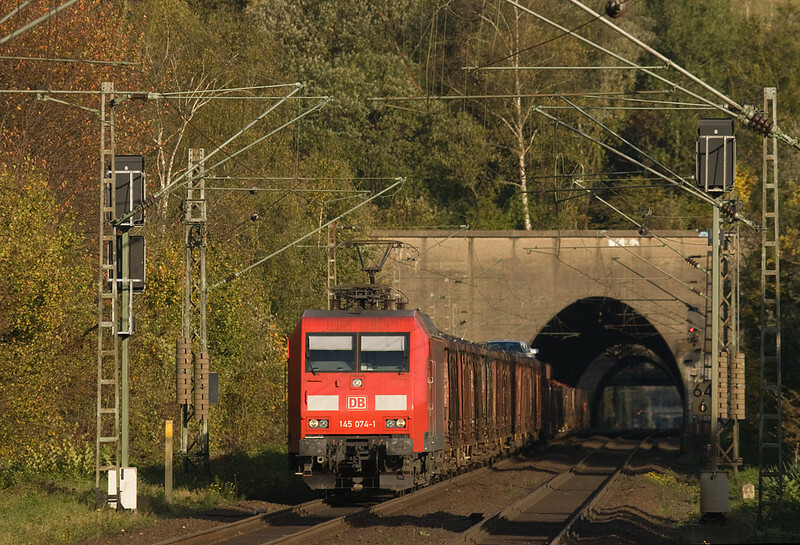 The 55s will continue to operate about one third of the trains, while the 241.8s will be reassigned to southern Germany. 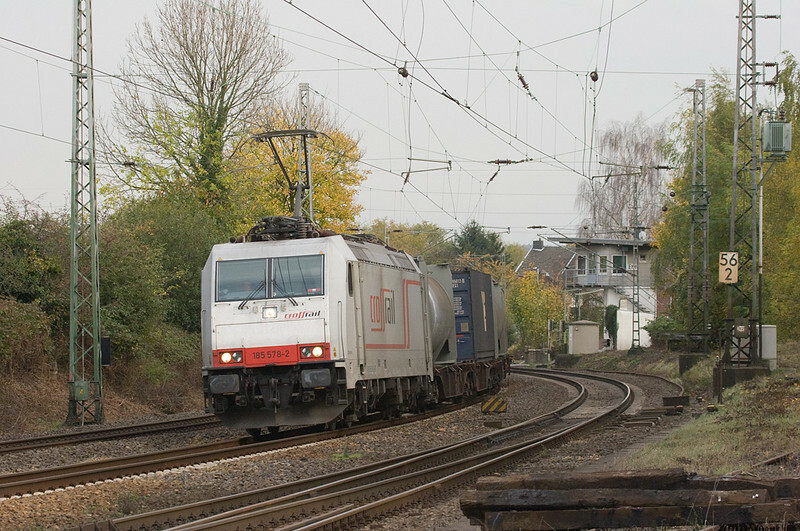 There are black flags on the 28 and 241.8, and the sign on the 23 reads: "DC Montzen - GMN - Derniers Trains 13-12-2008". Farewell, Montzen yard! 29-Nov-2008 Bit of a change of pace here... 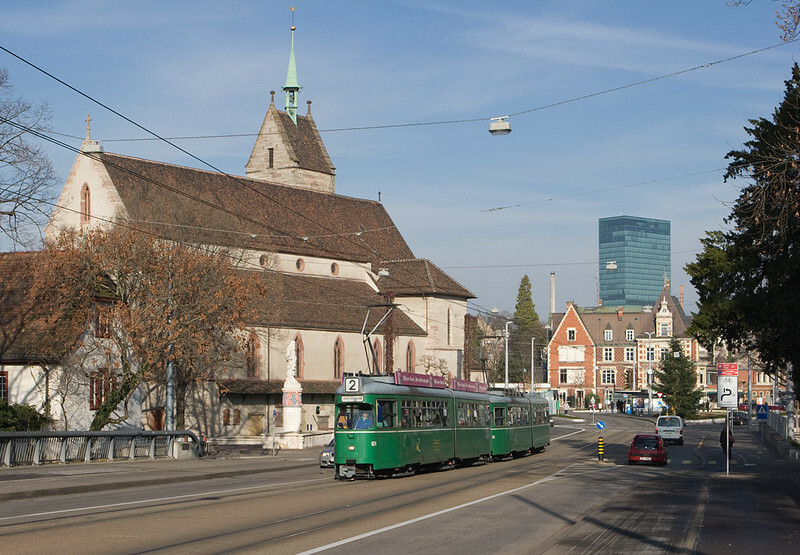 I was in Basel, Switzerland and took the opportunity (and total lack of decent freight train traffic) to look at the remarkable trolley system they run down there. Among other things they run a spit-and-polish fleet of older articulated cars, including a good number of Duewag products from Germany. These are well sought-after by fans and enjoy almost a religious following among tram enthusiasts. Here in a virtually timeless view two 36 year old Duewag 6-axle cars form a service on line number 2. They are just crossing onto the Wettsteinbrücke running towards the SBB railway station. 24-Nov-2008 Montzen yard is facing retirement very soon indeed. In fact, barely two weeks remain until the new Traxxes are supposed to run through with freights into Germany. Whether or not the deadline will hold and just how well the new kids will perform is anybody's guess at this point as they still haven't made a trip up the hill yet. In this view 2326 and 2632 take a rest at dusk as the returning empty coal move CS 48562 (Mannheim - Zandvliet) is led across the hump and into the yard by trusty 55s 5537 and 5505. CS 48562 (Mannheim - Zandvliet) empty coal train in Montzen. 24-Nov-2008 We don't usually get much snow around here; truth be told our winters are quite pathetic. This weekend the first snow moved in, and it snowed two days (but never stayed cold enough for the snow to linger). Still, falling snow is good for pictures so an effort had to be made to capture some of it. 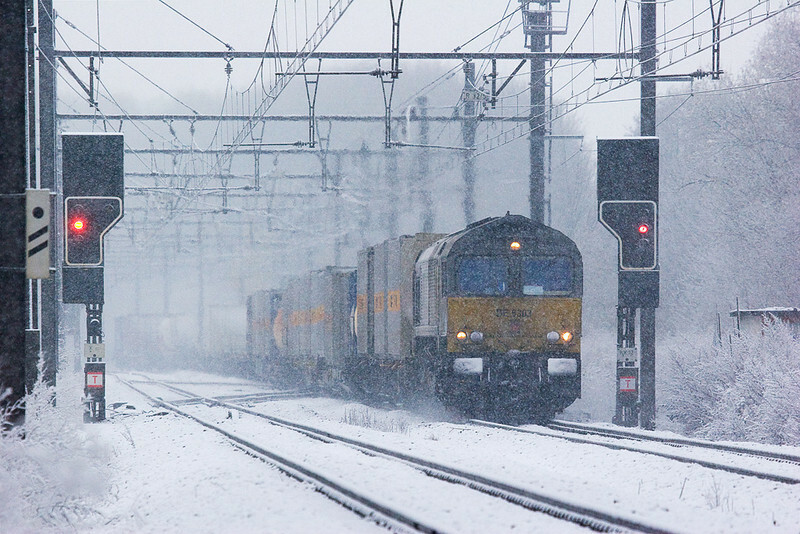 Here's DLC's DE 6303 with the DGS 41531 (Terneuzen - Ludwigshafen BASF chemicals) in drifting snow in Remersdaal. I bet the canadian-built unit feels right at home... DLC DE 6303 with the DGS 41531 (Terneuzen - Ludwigshafen BASF) in Remersdaal. 31-Oct-2008 I've been posting a few pictures from my trip to Britain below. This is the final one I'm going to post here, go to the Great Britain gallery to see the rest. With the low winter light upon us, these kinds of shots sort of sweeten the fact that days are mighty short now. 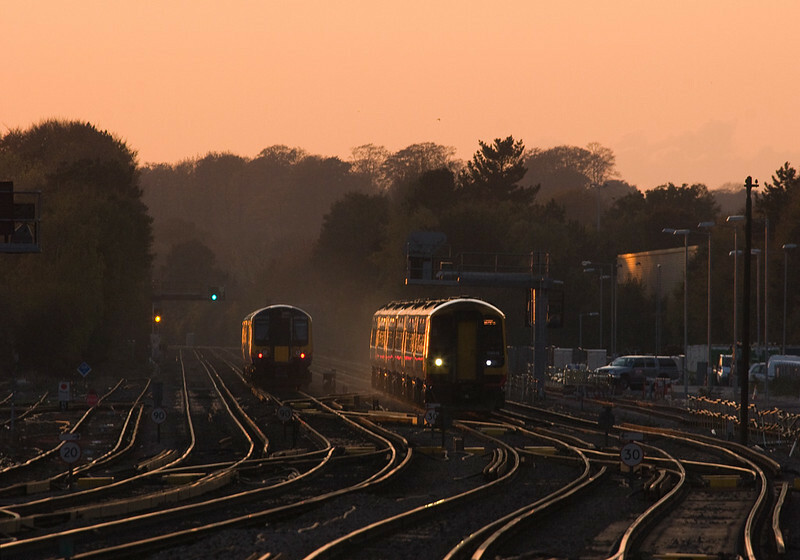 At least one can do that and easily be home for the evening news... Southwest Trains 159/1 inbound passes a 450 outbound in Basingstoke at sunset. 26-Oct-2008 Tiptoeing through Hatton South Junction a 165/0 comes up the branch from Stratford-upon-Avon, birthplace of William Shakespeare. Hatton retains a lot of character despite the changes to modern infrastructure like the LED signals. Chiltern Railways 165 037 in Hatton. 26-Oct-2008 The clocks were adjusted to winter time this Sunday so darkness came early. I really wish we'd just stick with summer time all year, but what are you really going to do... The last rays of the setting sun glint off a 168/0 as it hustles underneath the road bridge and through Hatton station. 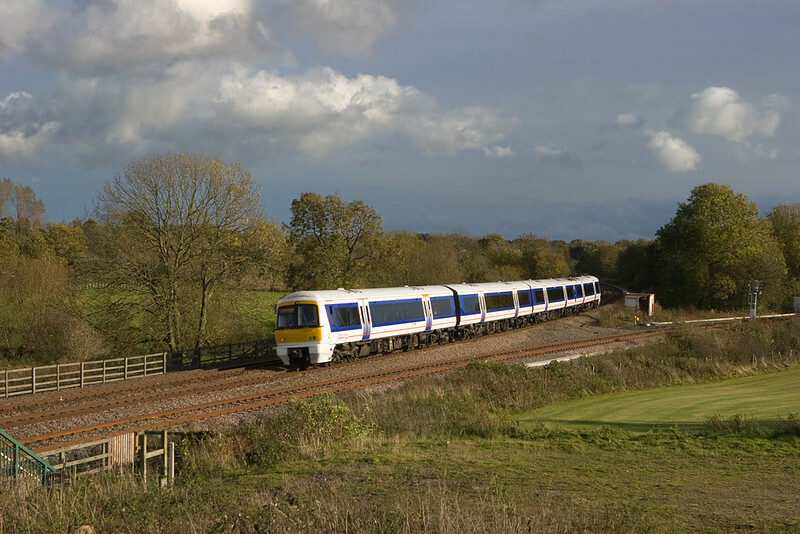 Chiltern Railways 168 004 in Hatton. 26-Oct-2008 This view looks north at Hatton North Junction as a London Marylebone-bound DMU comes flying through. The signal on the other track still displays "advance approach" from a northbound that passed before. If you plan to come to this place do make sure you are equipped with adequate footwear. The fields can be rather wet and muddy. 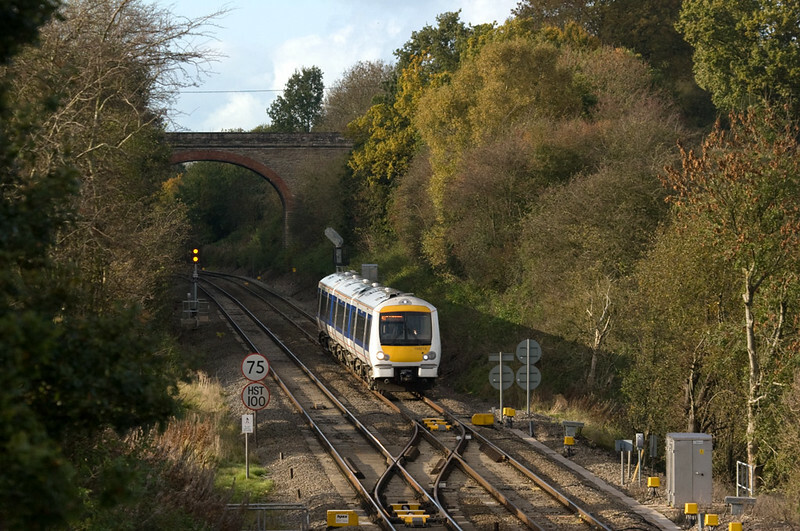 Chiltern Railways DMU class 168/2 southbound at Hatton North Junction. 26-Oct-2008 A trip to Coventry in the British Midlands netted a few hours of railfanning. Being a Sunday window trains were all I got, but it was still fun. In this signature shot at Hatton North Junction a 168/0 storms northbound around the sweeping curve just past Hatton Station. This is a great place to hang out for a while and my thanks go to Peter Tandy for disclosing it to me. 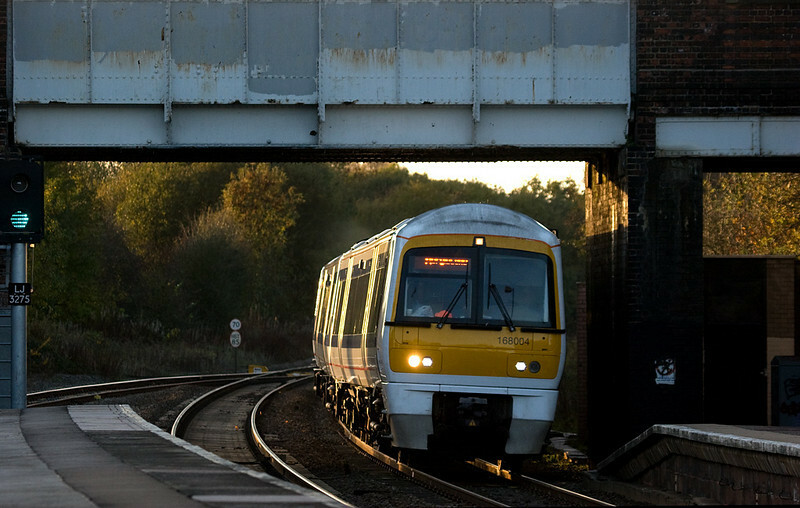 Chiltern Railways DMU class 168/0 northbound at Hatton North Junction. 22-Oct-2008 Another shot from the same location, but with some elevation gained by putting the sound barrier to good use. 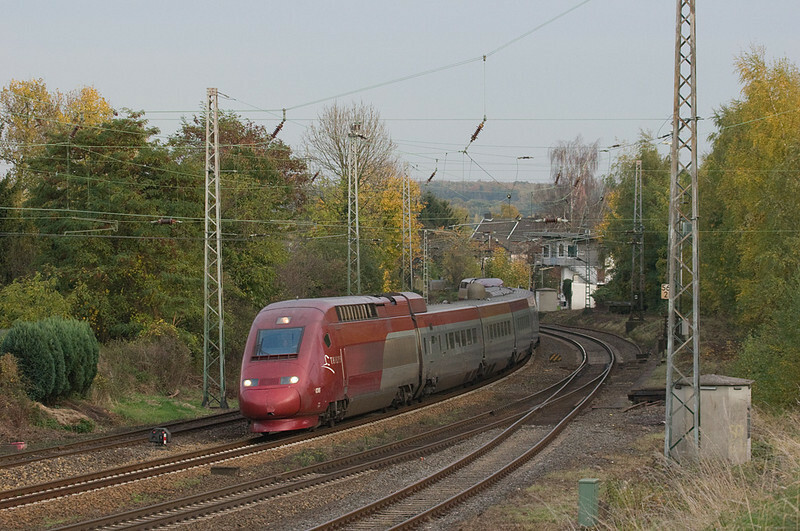 The Thalys high speed train is a variant of the French TGV, running between Cologne and Paris-Nord by way of Brussels. Westbound Thalys in Eschweiler. 22-Oct-2008 The German line KBS480 between Aachen and Cologne (Köln) provides an interesting variety of traffic. The town of Eschweiler used to be a hotbed of coal mining and other industrial activity in times gone by, but almost nothing remains. What does remain, though, is the last set of manned crossing gates on this line, the operation of which is controlled by the operator in Ehf tower. 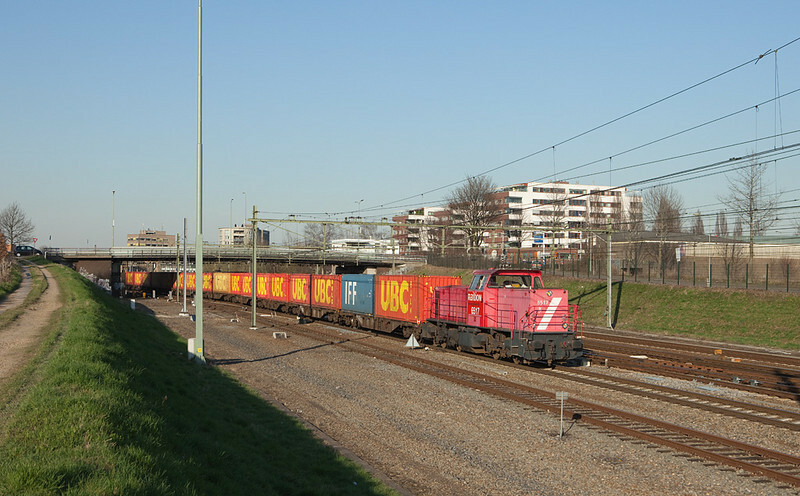 Here a westbound intermodal train operated by the newly-formed consortium of Belgian operator DLC and Swiss/German operator Crossrail passes the tower and swings around the curve leading up to Eschweiler Hbf train station. This spot is an excellent day-round location for both east- as well as westbound trains. Crossrail 185 578 with the Ewals train DGS 40162 (Novara - Genk) in Eschweiler. 19-Oct-2008 Just a short walk up the hillside from where I live, a usually quiet sunday afternoon provided this view. With abundant traffic on the L24 between Aachen West and Montzen, the weather usually is more of a concern to take a good photo. On this sunday, everything came together. 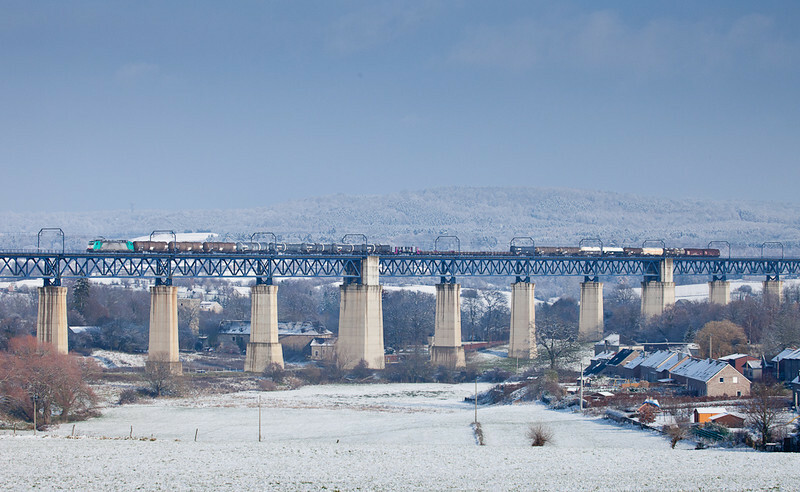 Ambrogio train TEC 40084 (Gallarate - Muizen) crossing the viaduc de Moresnet. 28-Sep-2008 In search of some autumnal color an early quit from the office enabled me to go and hang out at the Eilendorf train station on the Aachen-Cologne line for a few hours. I'm not a big fan of platform photography, but this location is quite nice in that it provides an interesting backdrop with the dual tunnels. At least for westbounds. It is a total loss for eastbounds, so one has to be prepared for a few cases of gnashing the teeth whenever something interesting appears that way. This Railion (or DB Schenker as they are now called after the umpteenth name change) class 145 brings her Belgium-bound junk freight west in glorious late afternoon sunshine. 145 074 with FE 44532 (Gremberg - Antwerpen-Noord) in Eilendorf. 26-Sept-2008 This shot is a harbinger of things to come. 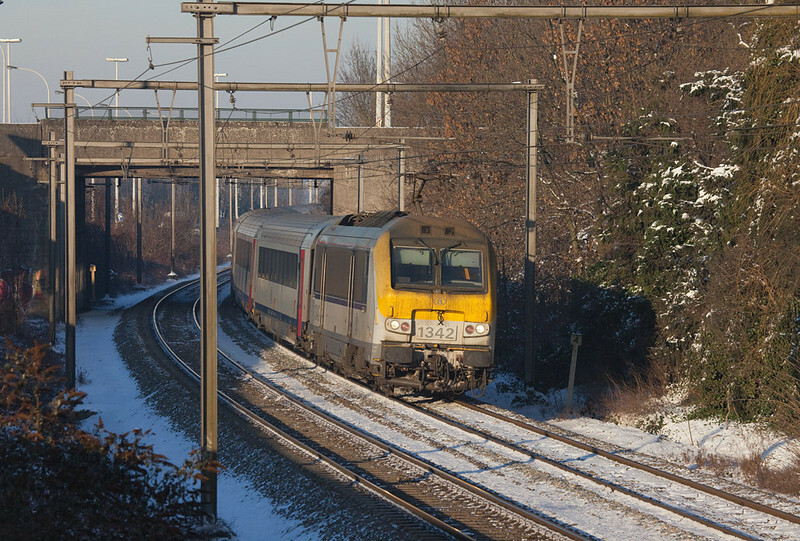 Most obviously, the almost brand-new 2800-class electric engine (known as a class 186 in most of Europe and a Bombardier Traxx F140MS to the rest of the industry) have been arriving in numbers into Belgium from Kassel, Germany. 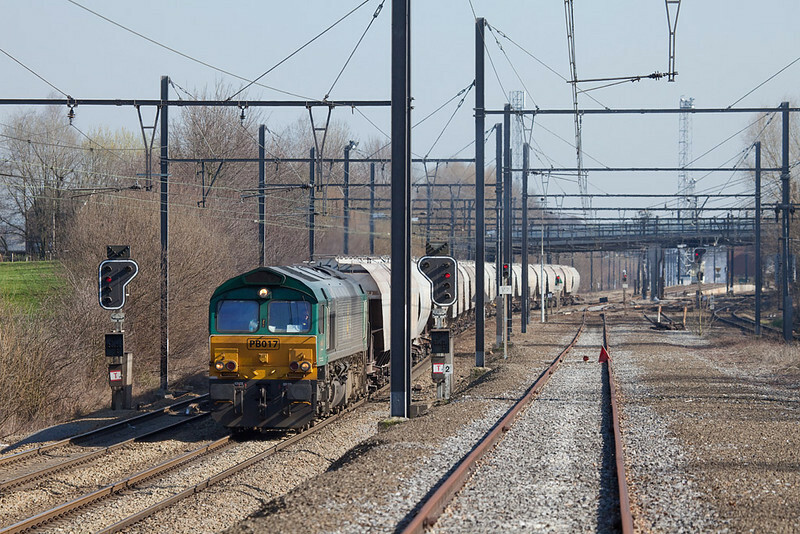 Eventually a full 40 of these locomotives will put most old Belgian electrics and a good number of the class 55 diesels out of work. Less obviously, the small yard here at Vise Bas is slated for abandonment and redevelopment. The tank cars are for the local serving the CBR cement plant in Lixhe on the other side of the river Meuse. With the yard gone it is yet unknown how the local will work. A straight run up from its base at Liege Kinkempois seems most likely. 2803 with DGS 48266 (Wanne-Eickel - Aulnoye) in Vise Bas. 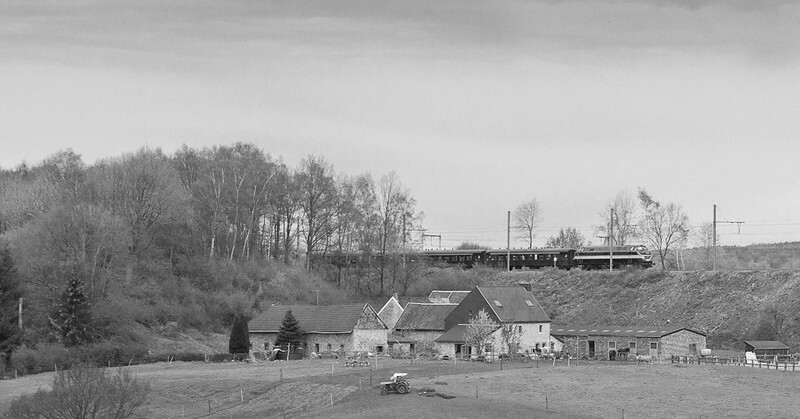 28-Apr-2012 If you squint real hard it's 1968 again as a class 200 diesel-electric leads a train of K1 coaches onto the L39 past an archetypal eastern Belgian farm. In reality this was a train operated for British enthusiast company Mercia Charters around the Belgian network today. I usually stay far away from fan trips but did go out briefly only because it's rare enough to be able to shoot anything on the L39. The lumberjacks have done a lovely job of getting rid of the greenery and opening up scenes like this for maybe the next 2 years. Witnessing the sheer number of grown adults in highviz vests messing around with ladders and just generally behaving silly made me walk back home quickly. I cannot stress the point enough that you really should go out and shoot ordinary everyday workings. That way you will have all your pictures once the time comes for the "final run this" and "final possibility that". Concentrate on getting satisfactory pictures and let the equipment get "rare" and "sought after" all by itself. 5166 leads the Mercia Charters train 18527 onto the L39 in Montzen. 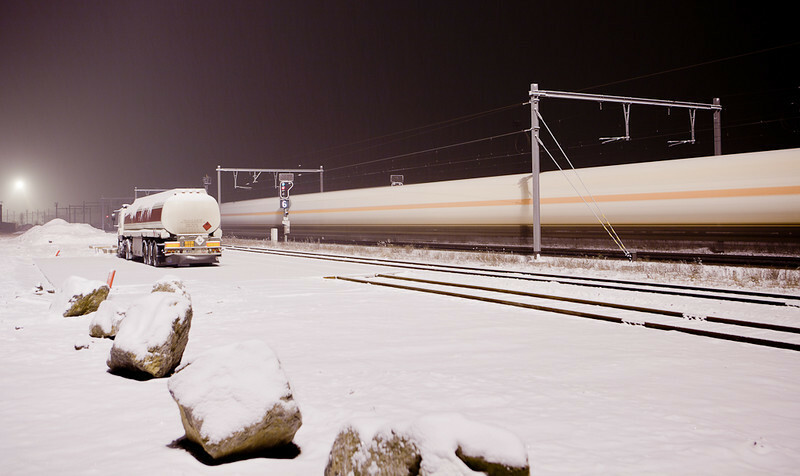 Speeding trains and flying snow are a nice combo. The result of today's quick lunch break outing has both, and in a rare patch of milky winter sun to boot. Not a bad thing. The 7 degrees below made for a speedy return to enjoy a hot lunch. Kohlscheid station is at the top of what used to be a helper grade. You can see the severe vertical curve on the near (northbound) track. 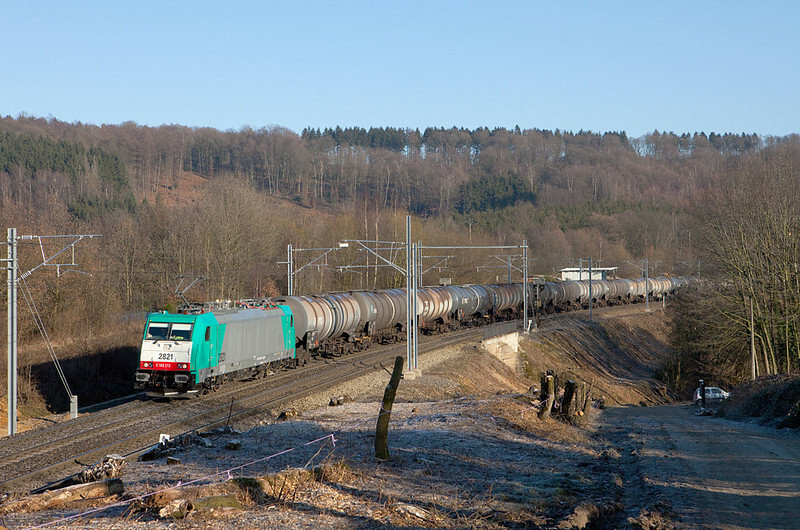 111 146 leading an RE4 through Kohlscheid. Some more snow on the 29th proceeded to blanket everything in a nice and fresh white. I stopped at the customs shed in Montzen on the way home to try a few time exposures. White balance is key to these images, creating almost surrealistic results through balancing out the heavy color cast created by the floodlights. 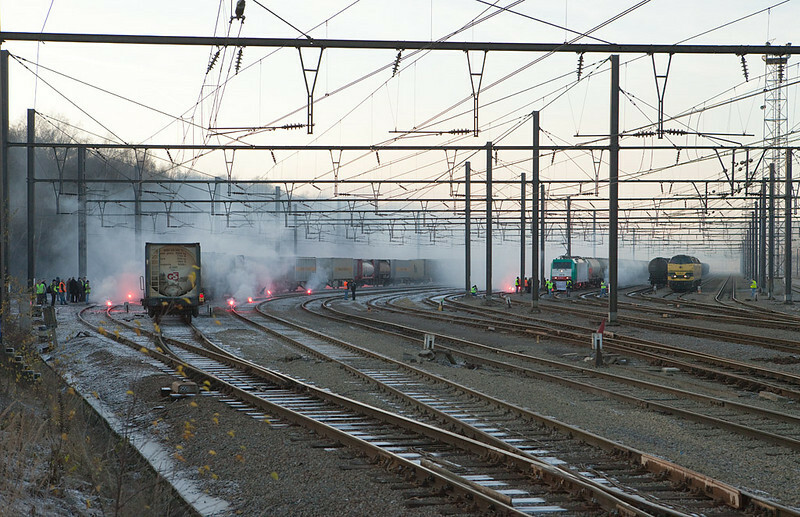 Here a cut of pressurized gas tank cars paints an interesting streak. The pole's shadow enhances the tube-like effect. 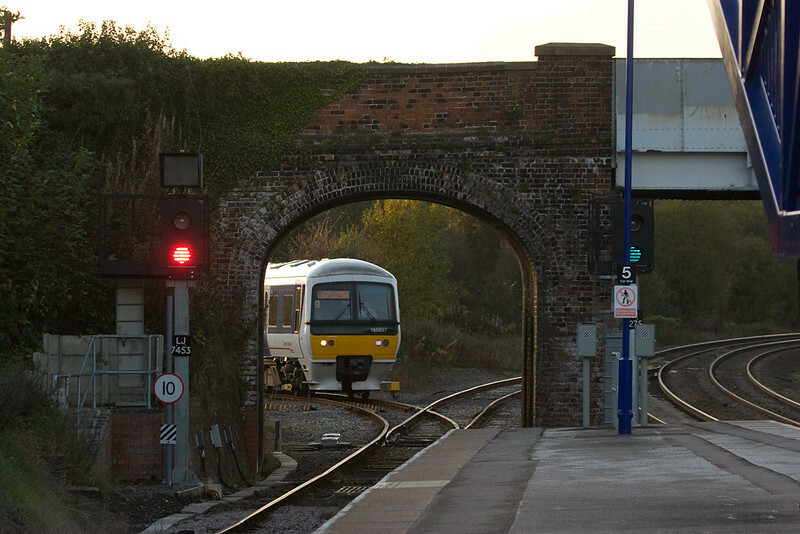 The shot was timed so the signal displays two indications on top of each other, a 60 km/h medium clear followed by dropping to stop as the train entered the signal's block. An early snowfall on the evening of the 25th of November was followed by beautiful weather the next day. An area of a mere 15 km in diameter was transformed into a winter wonderland, which coincided with a day off work. Talk about good timing! As overshot as this location may be it's still a fantastic vista. One of the junk freights from Gremberg slowly rolls towards a stop indication of the Montzen home signal to await an opposing move. Beyond the sugared-over ridge in the distance lies Holland. 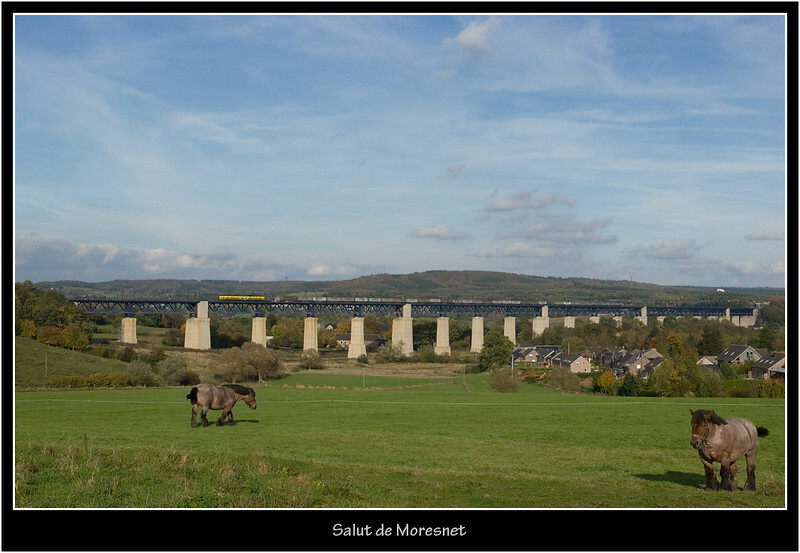 2808 with the 44518 (Gremberg/D - Antwerpen-Noord) crosses the Viaduc de Moresnet. 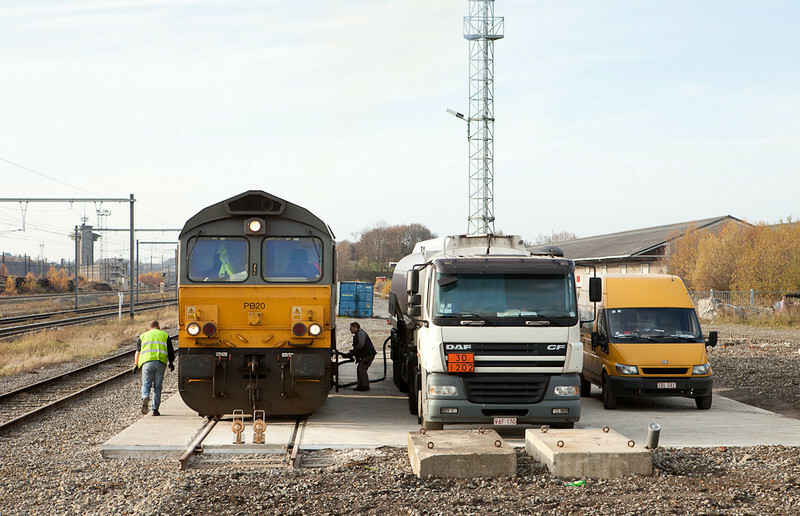 Infrabel has provided yet another new fuel pad for Crossrail in Montzen. The second version, behind the customs shed, never went into operation (see entry for 13-Aug-2010). The assumption is that the borough didn't like what had been done on environmental grounds and shut the whole thing down before it even started. This time around a proper concrete pad was cast, including an oil separator and waste water connection to the local sewer. The funky red trailer vanished and is still conspicuously absent, but may resurface again - who knows. For now the trusty DAF truck continues to serve. One of the few 66s remaining in full DLC colors, PB20, was among the first to be served a drink here today. DLC PB20 on the new fuel pad in Montzen. Winter time - night shot time. 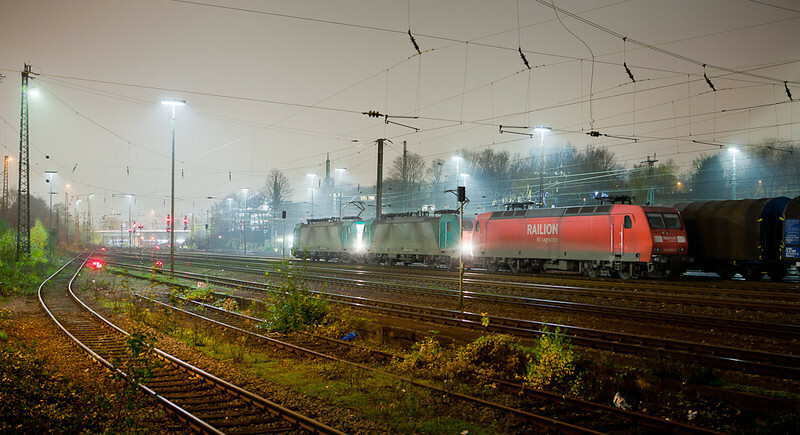 Today's frigid and foggy evening finds three Traxxes, 145 002 and two Belgian class 28s, await the next call to duty in Aachen West. The two Belgian units are fired up and ready to couple up to trains sitting in the yard tracks behind. 145 002 and two class 28s in Aachen West. Silly season starts today - it's 11-11 and the carnival fans are starting their thing. I decided to beat the horizontal rain, 5 degrees, and 65 mph wind to get a snap of a trainload full of class 139s and 140s headed for the scrapyard in Stolberg. DB is retiring the units fast and furious, so a picture of the procession seemed in order. Alas, the train was - unbeknownst to me - over an hour late at this point. I hung around for 30 minutes until I was soaked and freezing to the bone and decided to call it quits. In the event I did see this empty coal train returning to Zandvliet (Antwerp) from the power plant in Mannheim for another load of imported Brazilian or African coal. 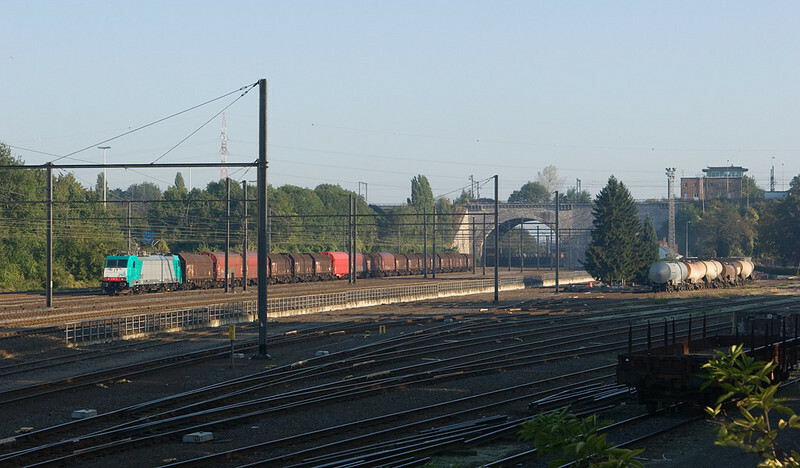 151 008 leads the empty coal train 48562 (Mannheim-Rheinhafen - Zandvliet/B) through Eschweiler. 25-Nov-2011 There's no complaining after such a beautiful month but it looks like we're back to our normal Belgian winter weather. It was fun while it lasted. Speaking of lasting fun, Railfeeding 1101 was back for more today and hauled a biodiesel tank car train westbound out of Aachen. Here she's seen seconds after exiting the Trois Bornes tunnel. That's Tour Baudouin on top and as you can see German catenary and German signals. The substantial building houses electrical equipment for the overhead - no sissy prefab metal sheds here, we've got bricks! The Infrabel logo adds a nice touch. It's hard to believe it's been three years since all those wires went up... Railfeeding 1101 with biodiesel tank car train Ingolstadt/D - Gent in Gemmenich.